Cassini flew by Saturn’s moon Titan on Saturday for the mission’s final close encounter with the Earth-like moon. NASA’s Cassini spacecraft sped by the moon Titan on Saturday, using the hazy world’s gravity to slingshot the probe on a trailblazing trajectory to explore the region between Saturn’s hydrogen-helium atmosphere and the planet’s famous rings for the first time. Closing out an era of discovery that gave scientists their first glimpses of Titan’s seas, weather patterns and rippling sand dunes, Cassini sailed around 608 miles (979 kilometres) above the moon at 0608 GMT (2:08 a.m. EDT) Saturday. The encounter served a dual purpose: Gather the mission’s final bits of close-up data on Titan, and reshape Cassini’s orbit to make the first passage inside Saturn’s rings. Saturday’s flyby was be the last time scientists will capture detailed observations of Titan for at least a decade, and perhaps much longer. Cassini’s scientific sensors planned to gather information on Titan’s lakes and seas, study the moon’s atmosphere, probe the interaction between Titan’s ionosphere and Saturn’s magnetic field, and take a sequence of pictures. “Cassini’s up-close exploration of Titan is now behind us, but the rich volume of data the spacecraft has collected will fuel scientific study for decades to come,” said Linda Spilker, the mission project scientist at the Jet Propulsion Laboratory in Pasadena, California. Researchers will spend the coming weeks and months analysing data from Saturday’s flyby, which sent Cassini past Titan at a relative speed of about 13,000 mph (21,000 kilometres per hour). Before Cassini arrived at Saturn in 2004, scientists knew little about Titan. The moon’s surface was hidden under an orange atmosphere rich in nitrogen, and NASA’s Voyager probes could not see through Titan’s hazy veneer when they flew by Saturn in 1980 and 1981. Cassini ushered in more than a decade of Titan exploration when it braked into orbit around Saturn on 1 July 2004. The plutonium-powered spacecraft made 127 flybys of Titan, peering through the moon’s clouds with radar to scan the moon’s landscape, finding seas, lakes and streams of liquid methane and ethane. Scientists say the radar images, which are generated by bouncing radar beams off Titan’s surface, helped create topographic maps of about a quarter of the moon, revealing complex river systems and liquid-filled depressions fed by rainfall, mountains and craters, and sand dunes resembling those on Earth. Titan’s surface temperature is a frigid minus 292 degrees Fahrenheit (minus 180 degrees Celsius), much too cold for liquid water. But Titan, the only moon in the solar system with a dense atmosphere, experiences day/night cycles and seasons remarkably similar to Earth, with fluctuations in rainfall, cloud patterns and temperatures. Cassini also found that Titan apparently hides an underground ocean of salty liquid water and ammonia. A day on Titan, about the size of Mercury, lasts about 16 days, the same period of time it takes the moon to complete one orbit of Saturn. 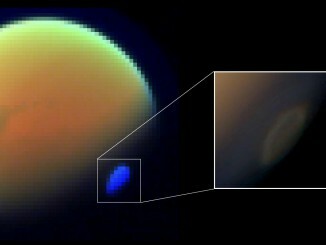 Titan is tidally locked to its parent planet, with the same face of the moon always turned to Saturn. Titan’s seasons change as Saturn orbits the Sun every 29 years, exposing the moon’s northern and southern hemispheres to more sunlight along the way, driving the moon’s weather patterns and moisture cycles. Cassini’s brush with Titan on Saturday — the 127th targeted Titan flyby of the mission — was the last time the craft will come so close to Titan, and scientists aimed to gather data on the moon’s reservoirs of liquid hydrocarbons. Cassini’s Italian-developed Ku-band radar bounced signals off a swath of Titan’s north polar region during the flyby, extending the coverage of the moon’s topographic maps. Scientists were eager to use the radar data for the first — and last — time to study the composition and depth of some of Titan’s small lakes. The radar beams also passed over a feature scientists have dubbed a “magic island” in Ligeia Mare, one of Titan’s large hydrocarbon seas. Images from Cassini’s radar have revealed at least two locations in different seas that appear to change over time, with bright reflections visible in some returns and not there in others. Scientists believe the “magic islands” are most likely caused by waves, and members of the Cassini team have developed models that could estimate wind speeds at Titan’s surface based on radar imagery of the magic islands. “Coupling these models to the brightness of the observed specular reflections (allow us) to potentially use Cassini as an anemometer, similar to the way we use weather satellites here on Earth,” said Alex Hayes, a professor of astronomy at Cornell University who studies Titan’s lakes and seas. Hayes said winds on Titan, which has an atmospheric pressure around one-and-a-half times that of Earth, might average around 1 to 3 mph. Researchers will spend the coming weeks crunching the radar data to see if the instrument detected any waves during Saturday’s encounter. “I’m not sure if we’ll see the magic island, but I think we have a better chance to see waves now than we have in any other flyby, statistically, so I’d say the chances are higher than they’ve been in the past,” Hayes said on 20 March in a presentation at the Lunar and Planetary Science Conference near Houston. Other observations planned during Saturday’s flyby were focused on ions and neutral gas lingering in the uppermost layers of Titan’s atmosphere, a tail of particles streaming behind Titan generated from the moon’s interaction with Saturn’s magnetic field, and an array of images from Cassini’s optical camera. Saturday marked the conclusion of Cassini’s exploration of Titan, but the mission still has nearly five months left to go. With a gravitational nudge from Titan, Cassini is now heading for its first passage between Saturn and its rings, ready to fly through a region that was long thought too hazardous to traverse. The trajectory will take Cassini through the 1,500-mile (2,400-kilometre) gap between Saturn and the inner perimeter of the D ring, a dark band of icy grains that is the closest ring to the planet’s yellow-gold cloud tops. Cassini will make the trip inside the rings around 0900 GMT (5 a.m. EDT) Wednesday, flying with its 13-foot-diameter (4-metre) dish-shaped high-gain antenna in the so-called “ram” position facing in the craft’s direction of travel. The Cassini project, first conceived in the 1980s, has cost nearly $3.3 billion from start to finish. Cassini launched in October 1997 from Cape Canaveral aboard a Titan 4 rocket, flew by Venus and Jupiter, and reached Saturn in July 2004, becoming the first space probe to slip into orbit there. The orbiter dropped a European probe named Huygens to land on the surface of Titan, Saturn’s largest moon, in January 2005. Since then, Cassini has circled Saturn more than 260 times, collecting detailed imagery of Saturn’s atmosphere and mysterious hexagonal polar vortex, explored its rings in minute detail, and observed 49 of Saturn’s 62 known moons with close and long-range flybys. Cassini was originally scheduled to collect data for four years after arriving in orbit around Saturn, but NASA extended the mission as the probe discovered that the planet and its moons demanded further study. NASA considered steering the Pioneer 11 flyby probe through a gap between two parts of Saturn’s rings in 1979. The agency again thought about guiding the Voyager probes through the so-called Cassini Division in the rings in the 1980s, but managers opted for a farther flyby out of safety concerns. “This is not without risk,” said Earl Maize, Cassini’s project manager at JPL. “You can see the dust kind of extending and slowly disappearing into the black. Navigators at JPL have kept Cassini right on course throughout its tour of Saturn, zipping by moons with remarkable precision and mapping out the probe’s trajectory years in advance. “Our concern is not our accuracy, but have we modeled that system correctly? For a couple of those orbits, the ring plane crossing is kind of flirting with the edge of where we think it’s safe,” Maize said. Cassini will fly through the gap at slightly different locations on each orbit. On four passages from May through July, the spacecraft will be closer to the D ring, and engineers will pivot Cassini to again put its antenna in the ram position on those orbits. Ground controllers will not know if Cassini survived the first ring gap passage until around 0705 GMT (3:05 a.m. EDT) Thursday, when radio signals from the spacecraft should reach Earth. Cassini will be out of radio contact with the ground team for about a day after zooming by Saturn while its instruments take measurements. Cassini’s will make 22 runs through the ring gap before a plunge into Saturn’s atmosphere on 15 September destroys the craft in a crushing finale intended to ensure it never crashes into one of the planet’s moons, such as Titan or Enceladus, that scientists believe might support microbial life. Scientists will use the up-close orbits to measure the mass of Saturn’s rings for the first time, inspect the planet’s atmosphere, and derive Saturn’s interior structure by studying its gravity field. “One of the things we can do with the rings is, in the grand finale orbits, for the first time address the question of the origin and the age of the rings,” Spilker said. “We’ll do this by measuring the mass of the rings very accurately. The Cassini spacecraft, though otherwise healthy, is running on its last few pounds of propellant. That means the clock is ticking until Cassini will no longer be controllable. There are no more missions to Saturn planned by NASA or any other space agency, although scientists are expected to submit proposals this week for a spacecraft that could launch in the mid-2020s to explore Titan and Enceladus, two of Saturn’s moons considered by researchers to be top candidates for life elsewhere in the solar system. But Saturday’s swing by Titan committed Cassini to its fate, and the craft will naturally fall into Saturn in September even if it runs out of fuel or fails. 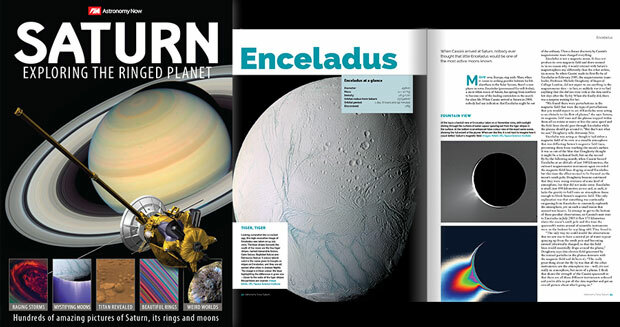 Find out more about Saturn and its moons in this 196-page special edition from Astronomy Now. Order from our online store. Scientists analyzing data from NASA’s Cassini mission have discovered that a giant, toxic cloud is hovering over the south pole of Saturn’s largest moon, Titan, after the atmosphere there cooled dramatically. 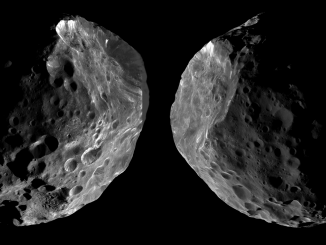 As it entered the Saturn system on June 11, 2004, Cassini passed Phoebe, the largest of Saturn’s outer or “irregular” moons, at an altitude of just 2,068 kilometres. 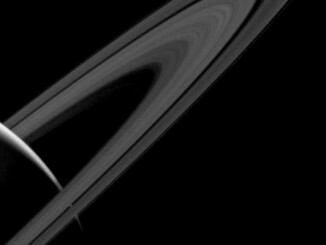 This image, taken by the Cassini probe, depicts Saturn’s main rings much darker than normal.